Washington DC, March 18, 2008 - In an order issued today, the United States District Court for the District of Columbia directed the Executive Office of the President (EOP) to show cause why it should not be ordered to create and preserve a forensic copy of any data storage media in use between March 2003 and October 2005 within the EOP. The order comes in a lawsuit brought by the National Security Archive seeking to force the EOP and the National Archives and Records Administration (NARA) to take steps to preserve and restore missing White House e-mails. Defendants must file a sworn declaration by March 21, 2008. "The Court's order may bring us closer to protecting the missing e-mails. I suppose the White House's inconsistencies and reversals on the facts are making the court as uneasy as we are," stated Meredith Fuchs, the Archive's General Counsel. "Why the White House needs a court order to take responsible steps to preserve records as required by law is perplexing." Reports of the missing e-mails first emerged in 2006 in conjunction with the investigation into the leak of Valerie Plame's identity by vice presidential aide Scooter Libby, and were renewed in April 2007, at which time White House spokeswoman Dana Perino confirmed the loss of e-mails. After White House Office of Administration (OA) Chief Information Officer Theresa Payton filed a sworn declaration in the Archive's lawsuit that appeared to conflict with statements that White House representatives had made to the House Oversight and Government Reform Committee, the Committee called a hearing. 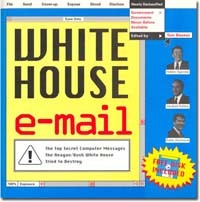 At that hearing on February 26, 2008, OA representatives testified that after months spent working (in conjunction with NARA) to develop a new e-mail archiving system for White House e-mails that would replace the one used by the Clinton White House, the decision was made in February 2007 to scrap the new system. Since that time, the White House has depended on an ad hoc, stop-gap method of archiving emails that was never intended nor suited to be a permanent system. As a NARA official commented to OA in November 2007, "I refer to it as a 'message collection system' even though we all understand that it hardly qualifies as a 'system' by the usual IT definition." In fact, an internal OA report that was released at the hearing indicated that "standard operating procedures for email management do not exist," and warned that "lost or misplaced email archives may result in an inability to meet statutory requirements." Forensic copies of the hard drives would preserve e-mails that may be available on individual work stations, but that are not present on the EOP's back up tapes. Those backup tapes were recycled prior to October 2003, so e-mails between March 2003 and October 2003 may not be on any of the existing back up tapes. In addition, there were indications at the House Oversight Committee hearing that the backups that have been saved as of October 2003 may not contain complete collections of the e-mails thereafter.